Unfortunately too many people have suffered from Alzheimer’s or experienced the effects of the disease. 244 Australians are diagnosed with dementia every day. 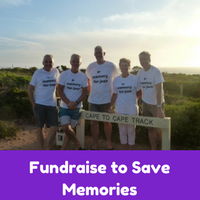 Join the fight to save memories. There are many difference ways you can fundraise for us. You may like to hold your own fundraising event, get active or join a fundraising activity. Whatever you choose, you are helping us achieve a world in which Alzheimer’s disease no longer exists.